Getting away after having children is drastically different than before children. I remember a vacation before the boys was easy - hop on the plane, go to destination, do as we feel. Sleep in, eat whatever/whenever, and pretty much play it by ear. But, once the children came, those expectations changed. Since having children, even a simple trip to visit family a few hours away has changed, so of course a trip to Walt Disney World is extremely different than before! Unlike before where we would start when we woke up/arrived for the day, with children, we make sure to be early birds (we have early risers, so we take full advantage of that). A must! Instead of waking up and lounging around, we continue our normal work day routine and head out the door at least 1 hour before park opening! The goal is to arrive 30 minutes before park opening. My real goal is be the family of the day. A girl can dream, right? Be welcomed to the Magic Kingdom by a Character of Main Street! Okay, so for the majority of kids, I wouldn't recommend using the evening hours, unless you're in the slow season when they extend only until around 9. I can't imagine too many children dealing well out until 3 a.m.! However, those morning extra magic hours are perfect in our family. The parks open at 8 a.m. with them, and by using them, we can avoid the majority of crowds and usually do 4-6 attractions in the first hour! Before kids (and pregnancy), I never stopped mid day. But, with kids (again, or pregnant) - especially in the heat - taking a break during the hottest part of the day is a lifesaver! We usually took a break after lunch - the crowds reach their peak from around 11 a.m. - 3 p.m., and we avoid that. There during thunderstorm season? You'll most likely miss those, too! Head back to your resort, take a nap, do a load of laundry, take a shower, or just a dip in the pool. Recharge your batteries (and those of the kids), and head back in the late afternoon. Naptime is a perfect time to hit the adult attractions! Used to going on everything whenever you want? Not likely with little ones. 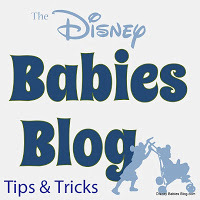 The whole group most likely can't go onto every coaster and with stroller naps, potty breaks, and meltdowns, there are some work arounds to still see and do everything without taking twice as long! With a small child and two adults, you can easily do all the attractions without waiting in line twice. Simply talk to the cast member near the entrance of the attraction and ask! For a more in depth post about Ride Swap, click here. For more tips and tricks, check out the "Travel Tips" link at the top, follow on facebook, pinterest, twitter, and stay tuned for more travel experiences!